Both the content and the publishing accomplishment of the magazine Strange Light are awesome. 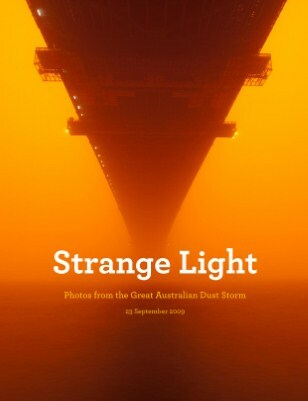 I had heard about the Australian dust storm on NPR, which almost did it justice through audio alone, but these photos are incredible. More incredible is this account of how Publisher Derek Powazek got the 40-page magazine out just 24 hours after the event itself. As Rex Hammock points out, discussion of the future of magazines usually revolves around the mundane issues of business model and revenue, rarely addressing radical innovation in format. This is an eye-opening example of the potent future of the magazine medium.